Image by slopjop via Flickr Understanding Acne - is a common disorder that occurs when glands secrete too much oil in the skin. The excessive oil causes pimples that are usually found on the face, but sometimes also on the back, shoulders, and chest. Pimple attacks are common among teenagers. But acne may persist in adulthood because of hormonal imbalance or too much estrogen (maybe that's why i still have some). During menstruation and menopause, stress due to emotional problems, and a bad diet. A more direct cause of acne is dirt and dead skin that accumulates inside oily pores, clogging them and causing a raise buildup.When a bacteria enters the picture, pimples occur. Other causes can include allergies, dehydration, heredity, and weakened immunity. Simple Prevention - First treat the surrounding skin area, not just the spot where the pimple is. This will not just heal the pimple but also prevent recurrence. And second do not over wash. Excessive washing will make skin even oilier and more likely to break out again. Also resist the temptation to pop your pimples. Touching causes inflammation making it more infected than it already is. Follow a sensible skin care regimen, including a mild toner that maintains the PH-balance of your skin and keeps it from dying out or getting too oily. Use the toner after washing with a medicated facial wash.
How To Be Acne Free In 3 Days! Humm... simple and nice tips on acne treatment. thanks. Don't squeeze, pop, or pick at pimples. 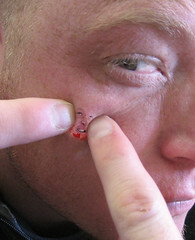 Squeezing a pimple can force debris deeper into the follicle, spread infection, and worsen a blemish. Remind yourself that "popping" that pimple can extend the healing time and may cause a permanent scar. Allow the blemish to heal on its own. good personal hygiene is really necessary and popping shouldn't be practice to avoid severe acne. Yeah, you're definitely right, but sometimes no matter what you do, it still keep coming back.